TROY, Mich. (AP) — In his final days in office, Gov. Rick Snyder wiped out the felony drunken-driving conviction of a man who pleaded for a pardon so he could seek a lucrative promotion as the next president of the Michigan Association of Certified Public Accountants. Jim Jagger's application for a pardon sailed swiftly: He filed in late October, got a hearing in December and won Snyder's blessing before Christmas, despite opposition from the Oakland County prosecutor, who vigorously claimed it was "special treatment" for a "career drunk driver," according to records obtained by The Associated Press. "The average Joe out there is not going to get a pardon" for the same crime, prosecutor Jessica Cooper told the AP. "Nor should they." It's not publicly known why the governor or his aides were so interested in helping Jagger, who makes $144,000 a year as a vice president at the CPA group. But with Snyder's term nearing an end, his staff put the case "at the top of the stack and said, 'Process this one,'" said Chris Gautz, a spokesman at the Corrections Department, where pardon files are screened. Jagger, 54, of Royal Oak, had four drunken-driving convictions from 1989 to 2007. It's typically a misdemeanor, but he faced a felony charge after the last arrest because of his repeat offenses. No one was injured in the incidents. Judge Michael Warren sentenced him to 135 days in jail, calling Jagger a "danger to the public." Jagger said he's a "leading candidate" to succeed Dzierzawski as president in 2019 but that a felony conviction on his record would put him "down on the ladder" and probably spoil his chances with the board of directors, according to a transcript. He said Dzierzawski was the only person at work who knew about his past. "I have a limited window of earning potential left, and I'm trying to maximize that. ... But even if it's not that opportunity, there will be other opportunities or I could actively pursue a job," Jagger said of the benefits of a pardon. "The me of 14, 15 years ago wouldn't imagine that I would have the life that I have now," said Jagger, who is married and has two children. "So regardless of the outcome of this, I'm a fairly lucky, blessed person." The parole board recommended a pardon, 9-1, saying Jagger wanted to enhance his career and volunteer at his children's school without the burden of a felony. Chairman Michael Eagen told Snyder that Jagger had made an "exemplary adjustment in the community." Gautz of the Corrections Department said the board was "never pressured" by Snyder's office about what to recommend. "The board's vote doesn't matter because the governor can pardon anyone he wishes," Gautz said. 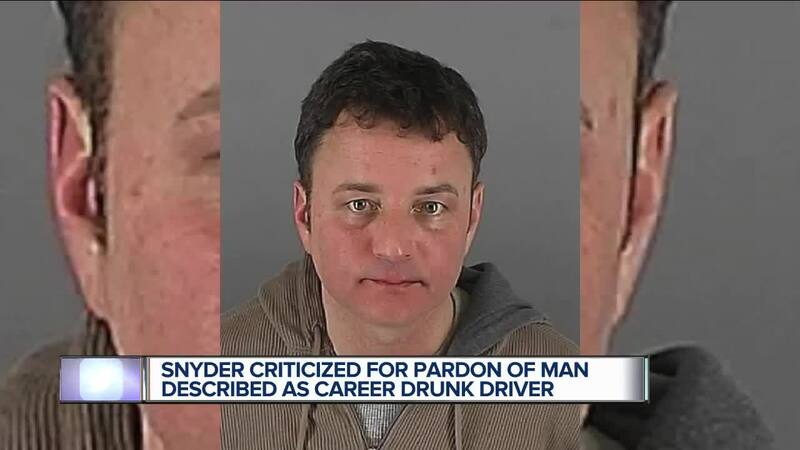 It wasn't the first time that Snyder, a Republican, had used his power to clear a drunken driver. In 2014, he pardoned Alan Gocha , a $250,000-a-year lawyer with political connections to Republicans. Gocha said the misdemeanor was making it harder to work and to travel outside the U.S.
On its website , the CPA organization said it had an "impeccable relationship" with Snyder. Rich Baird, a Snyder confidant who was his personal trouble-shooter around Michigan, appears in a video on the website, praising the association for being a "steadfast partner in so many of the things that we've done." Cooper, the Detroit-area prosecutor, smelled favoritism. She said Jagger's "standout features" appeared only to be his "high income job and his apparent connections." "The term 'justice is blind' is meant to reaffirm the core concept of the criminal justice system; that all people are equal in the eyes of the law, regardless of how rich or poor they are, and regardless of how powerful or powerless they are in society," Cooper said in a Nov. 28 letter to the parole board. "Granting Mr. Jagger's pardon request ... would make a mockery of this concept." "I'm sure they would all like to petition and be excused," she said. "I'm a prosecutor. We have strong opinions because we see the devastation, the families destroyed, the people who might never walk again" because of drunken driving. We wish to shine light on facts that have been left out of the story which broke today, about our Senior Vice President and CMO, Jim Jagger. Jim has been and continues to be a valuable member of our leadership team. Ours is an association of high integrity, and while Jim has been with us that has been our experience of his character. Our association represents CPAs in our great state, and while former Governor Snyder is a member and a supporter, the pardon granted by his office to one of our employees had nothing to do with his status, nor with a relationship. With the help of his attorney, Jim submitted an application for a pardon to the Parole Board and his request was processed according to Section 44 of the Corrections Code. Our focus is on the Parole Board’s 9-1 vote in favor of the pardon, on the charitable man we know him to be, and on the strong leader and devoted father we see every day. I’ve not yet formally announced my retirement, and when I do, a search committee will be appointed by our board of directors and will obtain a search firm. All candidates will go through the same just process before being considered for the role of President and CEO.